Bitcoin valuation has gone vertical in the past month or so. The speculative frenzy is truly astounding. Some have attributed this to the "scarcity" issue due to reduced reward per block of bitcoin mining (see discussion). That's utter nonsense. This is speculation - pure and simple. As more players jump on the bandwagon, prices take off. And as bartenders begin to give you advice about investing in bitcoin (which some readers have reported), you know there is a problem. Just to put this into perspective, bitcoin is up 3,772% from a year ago. Part of the reason for the recent spike is the mass entrance of Asian speculators, particularly out of China. With gold pressured by the Fed's impending taper and China's stock market not going anywhere, many in China are looking for action. South China Morning Post: - Mainland Chinese are among the biggest bitcoin believers. The currency lets them avoid capital controls and move the equivalent of thousands of yuan outside the financial system. They keep on buying in spite of the well known risks associated with bitcoin intermediaries. Bitcoin brokerage firms and exchanges are popping up everywhere. And some are disappearing as quickly as they show up. The Standard: - A local firm operating a bitcoin trading platform for mainlanders was shut suddenly last week, with investors losing up to 25 million yuan (HK$31.8 million). GBL, a local firm which set up the trading platform for bitcoin in June, attracted nearly 1,000 mainland investors. However, many users held off from trading in September as the bitcoin price kept surging and the firm suffered from a lack of cash flow. Both the Hong Kong and the mainland authorities are not sure what to make of this craze. Right now they are looking to see what the US will do. 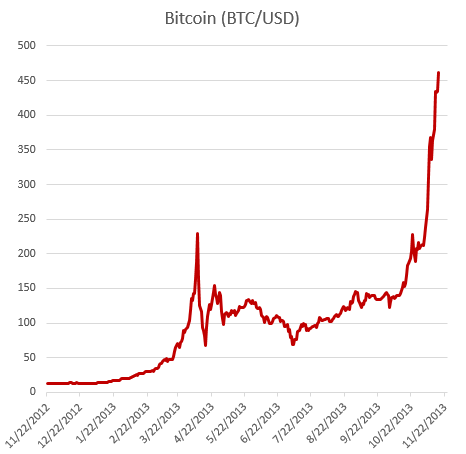 And in the US bitcoin is quickly becoming a major controversy. Wired: - On Monday, bitcoin and other digital currencies will come under the glare of the Senate Committee on Homeland Security and Governmental Affairs. And ahead of next week’s hearings, the five federal agencies with the most skin in the virtual currency game sent the Committee their take on this hot-button issue. According to letters penned by the agencies — which the Committee made available on Friday — all five are watching these currencies very closely, though some realize internet money has very legitimate uses that have nothing to do with criminal activity. Ironically that Senate action may itself be driving some of the frenzied buying, as market participants prepare for potential restrictions/controls on the virtual currency. Federal regulators have already been applying pressure on bitcoin intermediaries in the US. Wired: - Earlier this year, the DHS [Department of Homeland Security] seized about $5 million in bank accounts belonging to the world’s largest bitcoin exchange, Mt. Gox. Since then, the exchange has found itself shunned by much of the international banking community, and it has had difficulty moving money to its U.S. customers. Bitcoin businesses — particularly those involved in trading bitcoins for dollars — sometimes complain that they operate in a grey area, where it’s not entirely clear how or if they are in compliance with a patchwork of state and federal regulations. In spite (and possibly because) of all the regulatory risk, investors keep buying. While there is no ambiguity about the classic commodity bubble forming in this market, bubbles can last for a long time. Speculators are betting that as more people come into the Ponzi scheme, they will be able to unload their bets to this ever-growing number of entrants. Until the last set of suckers are left holding the bag.